Proteum is displaying the IMO III compliant Advanced 12M26.3 engine from Moteurs Baudouin for the first time at Seawork International 2019. 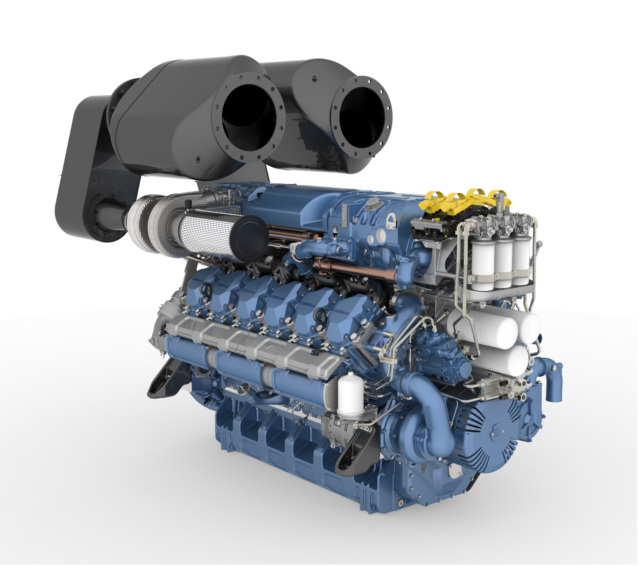 The heavy duty, four stroke electronic diesel is the most compact and competitively priced of equivalent IMO III EPA IV standard engines. This is due to its modular design and integrated Selective Catalytic Reduction (SCR) system, which gives operators greater flexibility in installing the engine to the boat. The redesigned 12M26.3 with SCR provides a cleaner, quieter engine with superior fuel economy and no loss of power; it also offers low speed torque for better manoeuvrability and increased acceleration, while an up to 2% reduction in fuel consumption delivers an extended range of between 2800 and 4700 nm. The M26.3 with SCR electronic range is available in power settings from 331kW (450hp) to1214 kW (1650hp). “In the M26.3 range Baudouin has addressed the challenges posed by the latest IMO and EPA standards to achieve cleaner shipping by delivering a practical, affordable and fully compliant propulsion system”, said Neil Taylor, Head of Sales for Proteum, the UK & Ireland distributor for Moteurs Baudouin. The UN’s International Maritime Organisation’s Tier III of the IMO NOx regulations aims to reduce nitrogen oxide emissions (NOx) by approximately 70 per cent compared with Tier II. On January 1 2016 IMO Tier III came into force impacting every new vessel over 500 gross tonnes and with engines more than 130kW. These regulations apply to vessels in North America, the US Caribbean, the Baltic Sea, the North Sea, and all future NOx Emission Control Areas (ECAs). Ship owners and ship managers placing orders for new build ships intending to trade in these areas, whose keels will be laid on or after 1 January 2021, will be required to ensure that compliant engines are supplied. This means Tier III engines or Tier II/III engines under Regulation 13 of MARPOL Annex VI -Tier II/Tier III engines being capable of operating at Tier II status outside of NOx ECAs and Tier III status when the ship is operating within a NOx ECA. For over a century Moteurs Baudouin has been a dedicated designer and manufacturer of marine engines for the commercial marine, fishing and shipping sectors. Baudouin engines are highly regarded by commercial operators as they are purpose designed for the marine industry and offer a wide power rating range combined with competitive fuel consumption. Baudouin also builds its engines to forecast, not to order, to ensure availability for customers. Proteum is exhibiting Baudouin engines on Stand PO12 at Seawork International in Southampton, 11-13 June 2019.